As the summer winds down, there are plenty of shows that you could be watching to fill up the time before the regular TV season begins. Sure, you could probably find another show to binge on Netflix or Hulu — or go with the old standby of re-watching one of your favorite shows. But allow me to tempt you with something your life is missing tremendously. HBO’s original series created by, and starring, Issa Rae is easily one of the best shows you’re not watching. It follows Issa as she navigates life in Los Angeles, which includes pitfalls and triumphs of the usual twenty-something character: friendships, relationships, jobs, and understanding your place in the world. But the show makes those journeys actually feel real. The series is accessible and downright hilarious, but also carries so much heart. 1. Issa Rae is incredible. If you’ve ever read Issa Rae’s memoir The Misadventures of Awkward Black Girl (which you should if you haven’t already), you’ll know that she is truly hilarious. She has a way of explaining life in a way that you really know she gets what you think and feel. This, wonderfully, translates on screen to Insecure. She not only makes you want to be her friend, but her mirror chats with herself are something we can all relate to when we try to pump ourselves up. This girl’s shine is about to blind us all, so why don’t you just hop on the train now? 2. The cast is stellar. 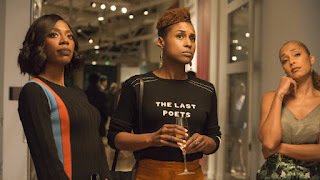 Not only is Issa Rae an absolute star, but the rest of the cast is fantastic as well. Her best friend is played beautifully by Yvonne Orji. Frieda is the awkward, but lovable friend you work with. Tiffany, played by Amanda Seales, is that girl in the relationship that can’t stop talking about it that you sort of get annoyed with, but still talk to anyway. And Natasha Rothwell — who recently stole any scene she was in in Love, Simon — has you cackling more often than not as Kelli. Jay Ellis, Y’lan Noel, and Chad Kerr round out the cast of men that offer their own individuality to their characters and how they fit into Issa’s life. No one character is the same as the other, and I think that’s one of the best aspects of the show. 3. The friendships are important. Circling back to wanting to be Issa's friend, you’ll see yourself in the friendships Issa has. We all have a best friend like Molly, who is literally the exact opposite of us, but who will ride or die for us no matter what. It’s being able to rely on a friend — someone you can fight with (like when Issa tells Molly she needs therapy) and know that it’ll eventually blow over — that makes growing up and finding our place in the world that much easier. But it’s not just the friendship with Molly that you’ll love. Issa’s friends Tiffany and Kelli are people that you know you have in your life or have come in contact with. Frieda is a great work friend that you sometimes clash with. However the friendship is, at the core, the thing that sets the series in motion. Without these people — without Issa being able to use them as a sounding board — Issa would be a different person. For me, seeing female friendship at the core of a series is important in today’s society. We need shows that focus more on the friendship, like Issa and Molly’s, rather than the romantic exploits of a modern woman. A woman doesn’t always need a man, but she will always need her best friend. 4. The show is authentic. The authenticity really makes Insecure stand out. There are plenty of episodes where I have to hit pause and appreciate how real the show is. Sure, it’s a work of fiction, but the situations Issa finds herself in are entirely relatable. Sometimes we make mistakes and we have to live with the consequences, even if they hurt. Sometimes we say things that we shouldn’t, or hold back when we should have spoken up. Sometimes we don’t feel motivated to be better or move forward. We get stuck. We break up. We think we’re unlovable. We aren’t always a good friend. For a twenty-something watching this show, the subject matter is so relatable that you wonder if your own life is being monitored and mined for an upcoming episode. There’s something special about being able to relate to what you’re watching. It gives you a sense of comfort that reminds you that you are not alone. I don’t even need to elaborate further. It’s absolutely hilarious, will have you hitting pause more than a few times to process a line and really appreciate it for its innate and subtle humor. This is a writer’s room any writer would kill to be a part of. Most specifically, the mirror pep talks and anything Kelli says are hysterical. Insecure will make you laugh, while also having a ton of heart. Win-win! It’s literally eight episodes a season. EIGHT. At only 28 minutes! If you can sit down and watch an hour-long episode of a Netflix original series, you can definitely watch 26-28 minutes of absolute magic. Best of all? Season three premieres THIS SUNDAY, August 12! So, queue up the HBO app or head to your local library to rent the DVDs, sit back, and binge all 16 episodes of the first two seasons. It’s something you’ll thank me for later.